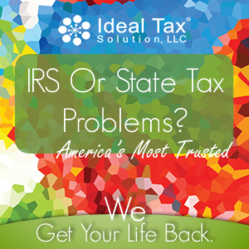 Ideal Tax Solution, LLC continues an energetic approach to expanding its market presence in expectation of an ongoing need for experienced tax resolution specialists who can provide quick, effective tax debt relief. IRS State Or Payroll Tax Problems? We Get Your Life Back. The need for tax liability relief continues to spur the growth and development of businesses which employ tax debt specialists who have the knowledge and expertise to quickly and effectively resolve tax problems. Ideal Tax Solution, LLC sees no letup in the demand for experienced tax resolution companies who have established themselves by providing thousands of tax liability clients the benefits of professional debt resolution services. The need for tax liability relief continues to spur the growth and development of businesses which employ tax debt specialists who have the knowledge and expertise to quickly and effectively resolve tax problems. Resolving tax issues requires a professional, purposeful approach which brings together all aspects of a tax resolution process, including the ability to positively and successfully interact with the IRS, which is what experienced tax relief specialists are trained to do on a daily basis. While the Internal Revenue Service has many tools at their disposal for collecting back taxes, delinquent taxpayers also have remedies available to them which can substantially affect the tax relief process. In the past, most delinquent taxpayers who found themselves in hot water with the IRS were not aware they had avenues of arbitration available to them, other than simply putting themselves at the mercy of the debt collection process and the agents who administered it. Fortunately today, we live in a much more user friendly world of tax resolution where tax help specialists interact with the IRS every day on behalf of troubled taxpayers. Within a free market culture like the United States, demand drives development of business markets which evolve as the need dictates. The present day financial universe overshadowing the growth of the tax resolution industry is one in which the IRS is being prompted to accelerate their tax collection processes, while at the same time taxpayers are being squeezed by economic pressures. And, as the need grows, so grows the industry. Providing tax liability relief for clients with an urgent desire to be free of the stress and strain of a tax debt collection process is relatively easy once the connection between a taxpayer and an experienced tax resolution company has been established. Selecting the right company to lead the way through the various aspects of the process is the challenge facing taxpayers with serious tax liability issues. It is incumbent upon reputable tax resolution businesses to reach out and let people in need know there is, indeed, professional tax help available. The challenge facing financial service companies is the need to offer superior customer service as the number of companies engaged in the business of tax resolution expands to meet the existing and ever-growing market for tax debt relief.